A new mum has described the shocking moment she woke up and discovered she had a 10-day-old baby boy after giving birth while she was in a coma. 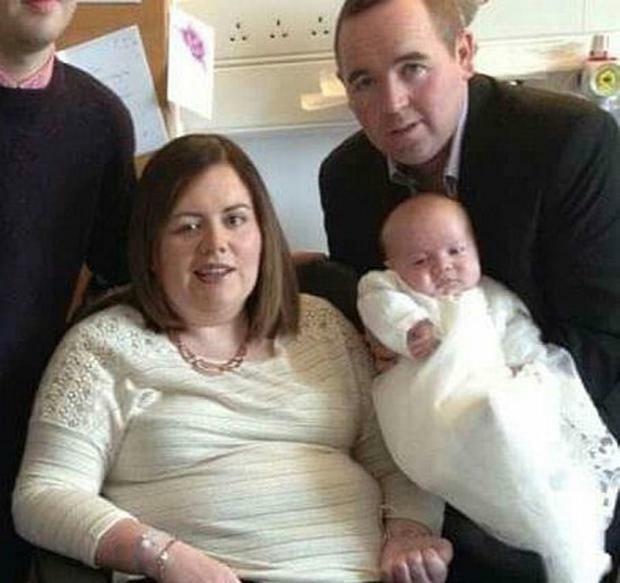 Ciara Murray (33), from Enniskillen in Fermanagh, suffered a stroke when she was 37 weeks pregnant and doctors had to put her in a coma to save her and the baby. Before the dramatic birth, Ciara had experienced a normal pregnancy and had barely even suffered from morning sickness. However, on October 29, 2015, she unexpectedly suffered a massive stroke because of a blood clot on her brain. Feeling unwell after breakfast, Ciara went for a lie down - but she didn't make it to the bed and instead collapsed onto the bedroom floor. 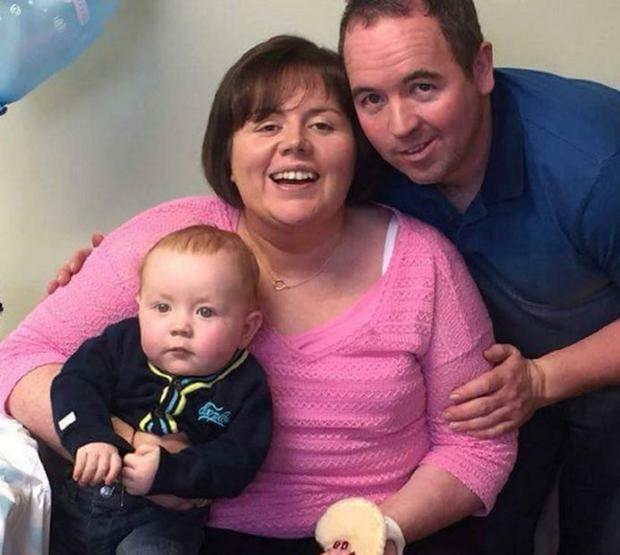 With her husband John (36) out at work as a bricklayer, Ciara was unable to move and she lay there drifting in and out of consciousness for seven hours. Ciara, who was working as a clerical officer in a school before she became ill, explained: "My husband was at work and I couldn't get up at all to get the phone. Every time I tried to pull myself up, I kept slipping down. "I couldn't feel the baby at all. I was far more worried about him than myself. I thought I had just fainted. "I was so frightened. I just had to close my eyes and hoped that the time would go quickly." When John came home at 6.30pm, she was finally able to shout out for help. "I was so glad to hear the key in the door," she said. "I said to him 'Is that you John?' He came in and he tried to lift me." 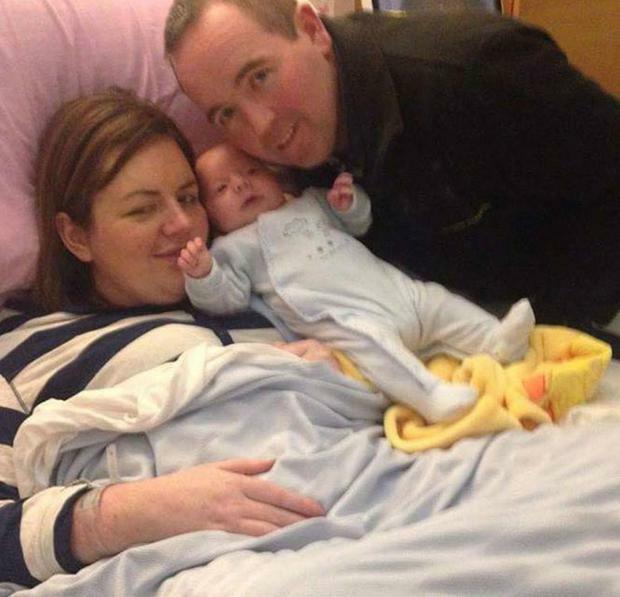 John rang for an ambulance and Ciara was brought to South West Acute Hospital in Enniskillen. Doctors told her that she had suffered a stroke, but luckily, a scan of her baby showed that he was fine. She said: "It was so lucky that he was alright, but they found that I had a clot on my brain and told me I had to be moved to the Royal Victoria Hospital. "I knew that I was very sick, but John tried to tell me that we'd be fine. That is the last thing I remember." Ciara was in and out of consciousness and the next day, they carried out a three-hour surgery to remove the clot on her brain and also performed a caesarean section. Her son James arrived on October 30, 2015, weighing 5lb 5oz. He was healthy and was able to leave hospital a few days later. However, it took 10 more days before Ciara woke up and met her little boy. She was placed in an induced coma after the operation to give her body time to heal. "Then she told me that I'd had a baby. I couldn't believe it. John brought him into me and it was just amazing. "I could hardly move but he just lay there on my chest. He was just a wee tiny bundle but he was perfect. "I just felt so lucky that he was doing well because I was so worried about him." Every day John had to take him home without Ciara due to the intense rehab she required in order to help her regain the feeling on her left side. The dedicated dad made the three-hour, 160-mile round trip from their home in Co Fermanagh to Belfast every day to make sure they got to spend time together as a family. She said: "It was quite a journey for him every day but it was worth it. Luckily, I had no problem bonding with James. I clicked with him and loved him straight away." After a month at the Royal Victoria Hospital, Ciara moved back to the hospital in Enniskillen for more rehab, meaning she got to see James twice a day - but soon had to return to Belfast for the next stage of her treatment. "After 10 weeks in Enniskillen, I moved to Musgrave Park Hospital in Belfast to the brain injury unit for intense rehab for three months," she said. "It was hell knowing that I had to leave the baby again." After her release from hospital on April 29, 2016, Ciara returned home and adapted to looking after her six-month-old baby. She said: "I had to learn to change a nappy with one hand as I couldn't use the other. It was definitely challenging but having to look after him was great motivation to get better and stronger." Ciara has had support from a local stroke group to help her to learn to live with the effects of her stroke, which had left her without feeling down the left side of her body. She explained: "Getting out with other young stroke survivors means I can talk about it with people who understand. "I am still having rehab as well, but it is a long process. I have regained some feeling in my leg, but there's no arm movement yet. "I am still in a wheelchair, but I can walk a bit round the house with a stick. I'm just working hard every day and I'm determined to get all my mobility back." Luckily, James, now 15 months, is thriving and didn't suffer any impact from the stroke. "He is completely fine," Ciara said. "He's full of energy and he's ready to walk at the minute. We're both trying to get on our feet at the same time." "Doctors still don't know what caused the stroke but I'm just so pleased that we're both doing ok now."